With the 4th of July fast approaching, what are your BBQ plans for the day? Same ole same ole hot dogs and hamburgers? Girls, put those buns away and shake things up with me this year. 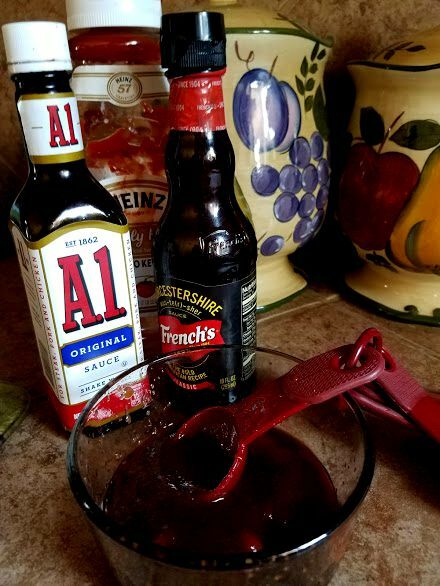 For today’s Tasty Tuesday, I’m sharing what should be on your Independence Day grill. My dad’s delicious marinated chuck roast and Mexican street corn. Grab your charcoal and lighter fluid or matches and propane and meet me by the grill! 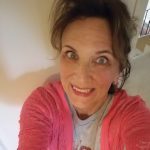 Warning: because I am sharing 2 recipes, this post is photo-heavy but worth that extra memory it’ll take up on your device. I promise. When I think of my dad, I remember a gentle, loving man who was often misunderstood by the people who loved him most and knew him best. My dad, DeWayne Roberts, was very intelligent. Had a PhD in pharmacology and worked for years at St. Jude Children’s Research Hospital as a cancer research scientist, starting shortly after the facility first opened. Once he retired, my father spent a lot of time writing. He shared his writing with my mom, my brother and sister and me but we struggled with some of the ideas and themes in his pieces. In some ways, I think my dad lived a lot of his life seeking to be understood but not ever completely realizing that. 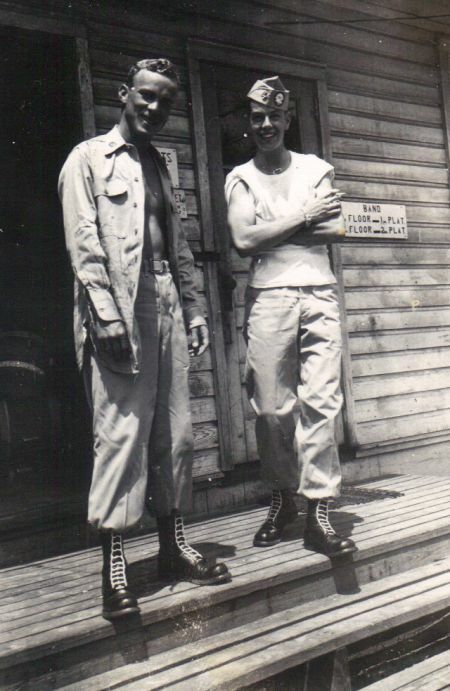 My father was a hard-working family man and patriot and an Army paratrooper. He was a good man, a very good man. And I miss him everyday. Here’s my handsome dad who was coincidentally, except there are no coincidences in life, stationed at Ft. Bliss, here in El Paso, where I met PC. He’s the soldier on the left. Ok, let me dry my tears. 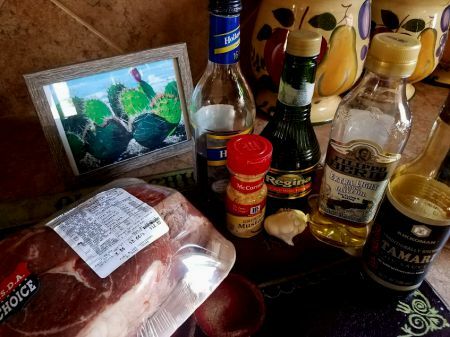 My father would make this marinated chuck roast on special occasions when we were young and every time we, his adult children, would come home for a visit. 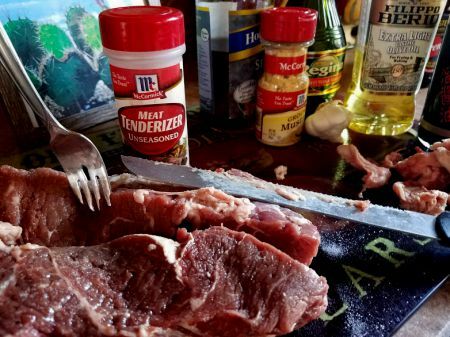 The meat needs to marinate for 24 hours so this is a recipe for which you’ll need to plan ahead. 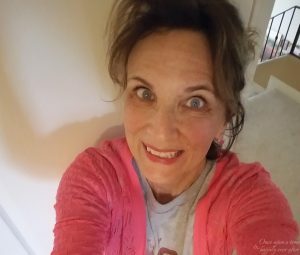 If you have joined me for any previous Tasty Tuesday posts, you probably remember I do a lot of subbing on the recipes I share. And I am not too keen on carefully measuring. I usually make something once or twice sort of following the recipe and then I just make it my own after that. But I don’t fool with this recipe. It is just perfect as is. Trim fat from your piece of meat. Sprinkle with meat tenderizer (which my dad really disliked using but makes cheaper cuts of meat better). Return the meat to the refrigerator in a zip-lock bag for an hour. In the meantime, mix up the marinade. 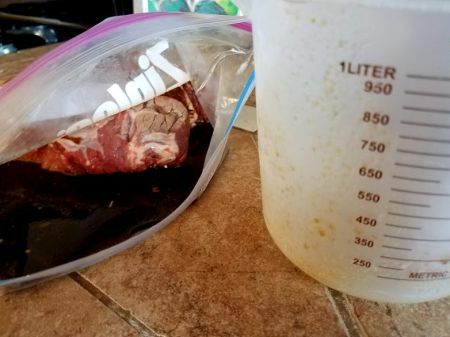 After an hour, remove meat from frig and pour marinade over the tenderized beef in the bag. Return to the frig for approximately 24 hours. A standard roast 1 1/2″ thick will take about an hour grill time. 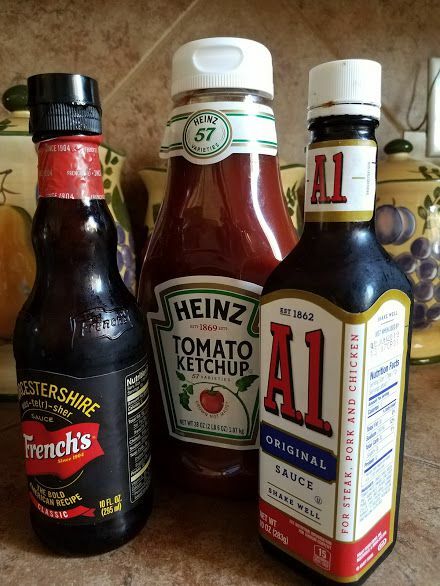 Mix up the grilling sauce. Brush onto the meat a few minutes before the meat has finished grilling. My dad always sliced the roast with an electric knife. Mmm, so good! Mexican street corn is an El Paso staple. It is sold at carnivals, outdoor music events, farmers markets, on street corners from food carts and food trucks. And it is so good! There are lots of great recipes on Pinterest for this west Texas delicacy. I combined two recipes for my Mexican street corn. 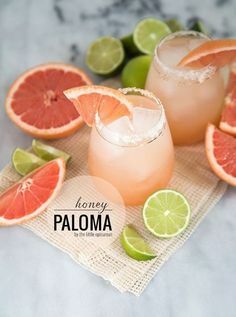 A pin from Pinch and Swirl, here and another from Genius Kitchen, here. 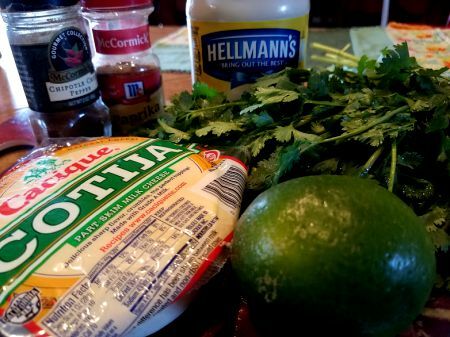 Here’s what you will need to make MY Mexican street corn. Spray corn generously with cooking spray. Grill 15-20 minutes over a medium-low flame, turning several times to ensure even charring. 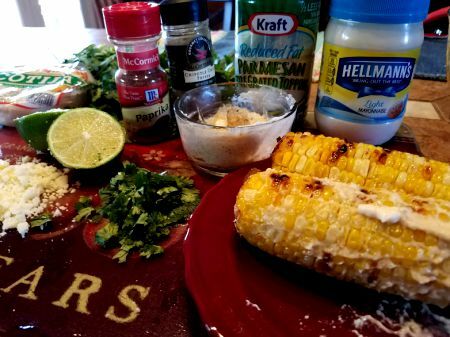 While the corn is grilling mix lime juice, Parmesan cheese, chili powder, cumin and ground red pepper into mayonnaise. 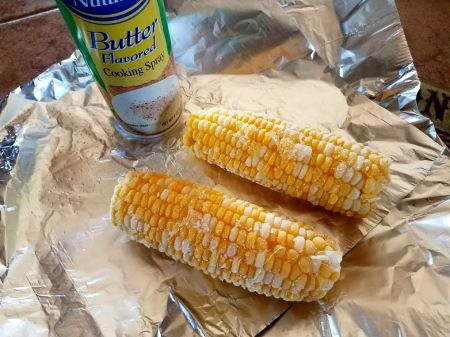 Remove aluminum foil from grilled corn. Brush each ear with the mayo mixture. 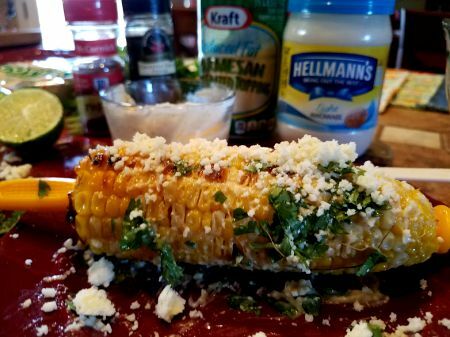 Roll each cob in crumbled cotija cheese and chopped cilantro. 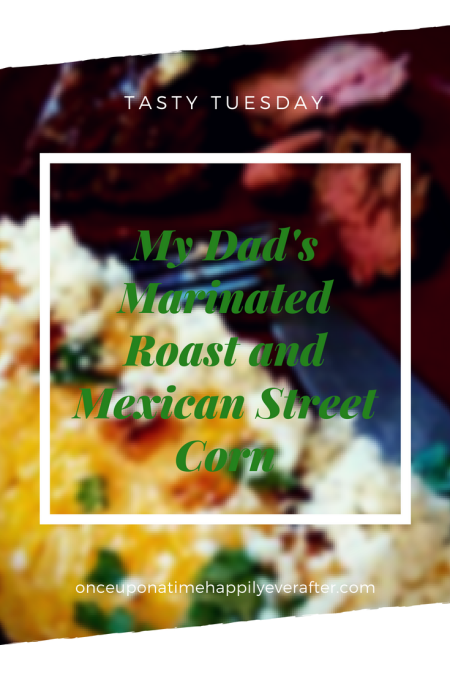 I served the my dad’s marinated chuck roast and Mexican street corn with au gratin potatoes. It would be good with a green salad, too, or maybe just fresh fruit melange. My mom says ‘melange’. Sounds so fancy. But at my house it is just strawberries, blueberries, blackberries, melon mixed together. Hope you will give these recipes a try. If your fam is reluctant to give up their traditional hamburgers and hot dogs this 4th, maybe you can shake things up with this savory corn. Would love to hear back if you try the marinated chuck roast or the street corn. Do you have a meal that reminds you of childhood? I have talked some about the homemade bread I make from my mom’s and her mom’s yeast starter. She did the cooking at our house so I associate most of my favorite childhood meals with my mom. 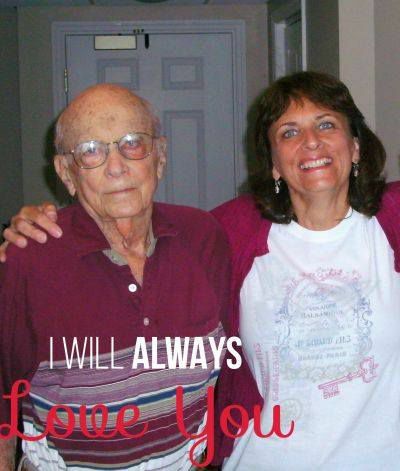 But I will always cherish sitting with my dad in lawn chairs in the backyard as he grilled this meat or while he churned a tub of homemade ice cream. Thinking of you, daddy! I love this picture. I am not sure I have this good a picture with daddy. He looks healthy in this picture, just like you caught him heading out to turn his roast on the grill. I think I will try this on Saturday. I have made it once and it did not turn out great. Didn’t marinate long enough. Maybe I will try to combine it with mom’s homemade bread, yum. I love the corny too. We have a food truck near School that makes awesome corn but none of the extras. They do offer cream or butter, but it is so good just grilled I get it plain. That way I save calories and can start the feast in the car on the way home. The boys have to fight for the small amount left. Thank you for coming by. Wouldn’t it be nice to sit with mom and dad in the backyard in Bartlett one last time? Maybe help churn the homemade ice cream? Do cartwheels in the grass? Ok, maybe not the cartwheels. I need to make bread, too. Will get it out tonight. Thanks for the reminder. Your corn sounds good. 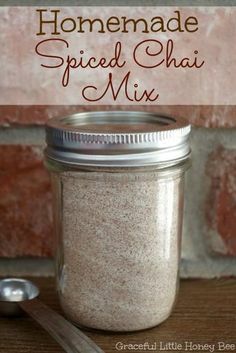 Maybe I will make this recipe for you when you visit!! Can’t wait. Sounds delish! I will have to give this a try. Thank you for sharing the backstory of your dad. Family doesn’t always think the same way about things, but fortunately we love each other enough to overcome our struggles. Looking forward to trying your happy recipe! Thank you, Em. Love does help us overcome differences and familial struggles. Great memories of your sweet dad! Loved all the pics! I’m planning our 4th of July menu now and making my grocery list. I’m wanting to “shake up” my menu, too, but we have so many kids that the burgers or hot dogs will probably have to stay! With littles, hamburgers and hot dogs are almost a requirement for the 4th But wish you would try the corn!! Truly so tasty. 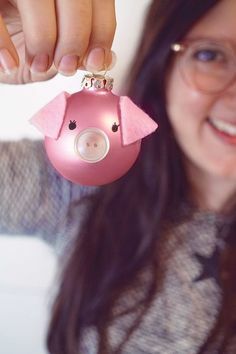 And it will give your holiday a little extra fireworks. The corn isn’t really hot, though. Just very flavorful. Love this! That corn looks crazy good. Pinning for the future! Thanks! Oh, the corn is so good. Please, please give it a try. I think you will be sold on it! Now you have me craving corn… I love corn this time of year. Wow, 24 hours of marinating the roast! I bet it is deliciously flavored! I can’t wait till my kitchen is done so I can try these yummy recipes! Hope you will try these recipes. I think everyone will love the corn and the roast. Both are so flavorful and something different. And you can put the chef’s hat on Brian’s head and make him head cook out on the grill!! Lovely to hear about your dad, he sounded like a remarkable man. We don’t celebrate July 4 over here, as you know, but I’m going to a family BBQ on July 1. We’re enjoying a long spell of hot weather and hope it lasts! We will probably eat burgers, steaks and sausages with lots of salad. Enjoy your celebration! How hot is hot over there? And do you have high humidity? I would think so but have never been to Great Britain. According to Ancestry.com, I am 95% British!! So hope to visit England someday. Thank you for the kind words about my father. He was a remarkable man. Hope he knows that I think of him and miss him everyday. I LOVE everything about this post. The love and admiration of your father are clearly evident – and the recipe is a fitting tribute. 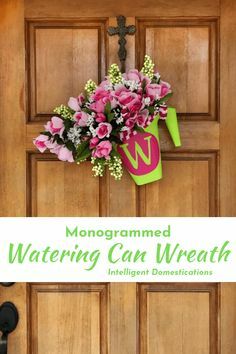 I will definitely pin and plan to prepare in the near future! 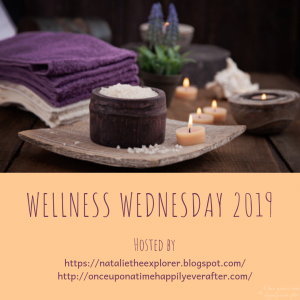 This is my first time to read a Tasty Tuesday post… but I look forward to searching through the archives :). I just recently began to document our Totoro Family Recipes to leave as a legacy for my children. Thank you for your kind words. I remember your mention of documenting Totoro family recipes on your blog. That is wonderful. We have a family yeast starter that was my great grandmother’s. My daughters and sister and I are all trying to keep the yeast going and make bread with it 4-5 times a year. Should try to make bread more often but I want to eat the whole loaf myself which is really no bueno!! 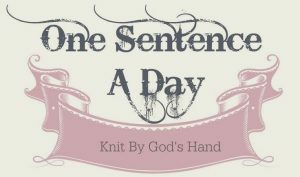 Thank you for coming by to visit my blog.